Our trek through the Conservation Area started at the Nainokanoka campsite. We hiked to the rim of Olmoti crater where we watched Maasai herd their cattle into the crater floor to drink from the flowing stream. We then drove up the very dusty road toward Bulati and the Empakaai Crater until the Land Cruiser could go no further. We hiked up to and around the rim of Embakai (Empakaai) Crater to our campsite. From there, we hiked down to the small village of Nayobi where we stopped for lunch. 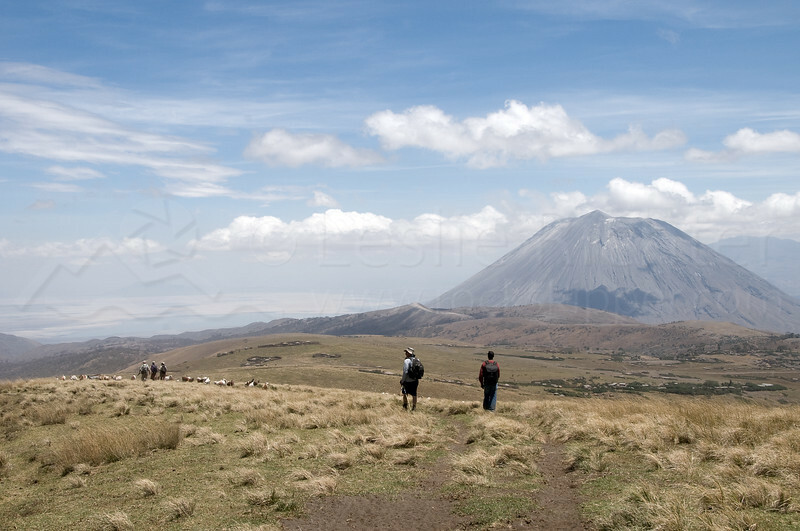 Then, it was another few hours to the Acacia campsite, at the foot of Oldoinyo Lengai, an active volcano. The last day we walked down the steep, ash covered hills that form the western edge of the Rift Valley. Heading NNE from Nayobi toward Oldonyo Lengai (Mountain of God).